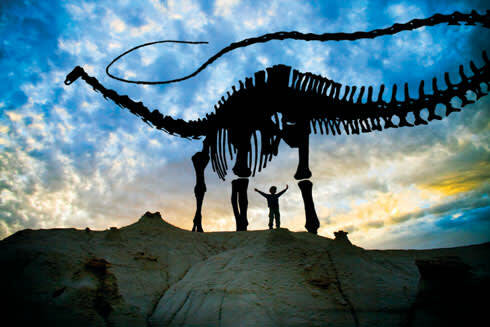 A big attraction for the Mesalands facility is the world’s largest collection of life-size bronze replicas of dinosaur bones and fossils, which are created at the college’s on-site foundry, using molds made with objects discovered during fieldwork. (The annual casting takes place March 9–14, a spectacle that’s open to the public.) The museum was the first in the world to display a torvosaurus skeleton, a carnivore from the Late Jurassic period. In BLM national monuments, designated wilderness areas, and wilderness study areas, fossil collecting without a permit is prohibited; violators may incur fines or imprisonment. Vertebrate fossil discoveries should always be reported to the BLM or a museum, because of their rarity and scientific significance. Collecting invertebrate and plant fossils for noncommercial use is allowed on non-wilderness and non-monument BLM lands. Fossil collecting on private land must be done with the permission of the landowner. Tromping up a dry arroyo flanked by scrubby creosote bushes and tumbled blocks of red mudstone, eight-yearold Dominic made his first discovery of the day. “Look at this, I found a fossil!” he shouted, and bounded across a limestone flat with a palm-size chunk of rock in his hand. Evidence of two brachiopods— shelled sea creatures similar in size and shape to clams—sat frozen in time and solid rock. Brachiopods still exist today, but these were likely from the Permian period—the youngest period in the Paleozoic era, roughly 299 to 251 million years ago. My son and I were exploring the Prehistoric Trackways National Monument, about six miles northwest of Las Cruces in the Robledo Mountains, and were starting to understand why our state is a top global destination for prehistoric discovery. Early life thrived here for hundreds of millions of years. At separate times in history, the landscape of what we now call New Mexico has included shallow tropical seas, lush tropical forests, and river floodplains—and, of course, their inhabitants. Evidence of this life lingers today: continental shifts, faults, rifts, and erosion have exposed the state’s rock formations, which contain fossil treasures for scientists—and even amateur explorers like Dominic—to find. The state’s vast rocky landscapes offer the opportunity for year-round discoveries, and easy access to monuments and museums makes spotting fossils a fascinating adventure through time. The Prehistoric Trackways National Monument, which spans 5,200 acres along the western edge of the Río Grande Valley in Doña Ana County, is a great place to start the adventure. Congress created the monument in 2009 because the park is deemed the most scientifically significant tracksite (fossilized trails and burrows of ancient insects, fish, and animals) in the world. The person largely responsible for the creation of the monument is Las Cruces resident and self-taught citizen scientist/ amateur paleontologist Jerry MacDonald. In 1987, MacDonald was hiking alone when he encountered the now famous Permian tracksites—known as the Discovery Site—where he excavated 2,500 slabs of trackways. The slabs now make up the Jerry MacDonald Paleozoic Trackways Collection at the New Mexico Museum of Natural History and Science, in Albuquerque. “This tracksite is the key to [interpreting] all the other Permian sites found around the world,” explained Michael Downs, former interpretive park ranger with the Bureau of Land Management in Las Cruces, during our guided hike to the site. During the Permian period, what is now New Mexico was in the western equatorial tropics of the supercontinent Pangaea, a large landmass that consisted of all the present continents. A shallow tropical ocean—the Hueco Seaway—covered southern New Mexico and was home to marine life such as arthropods, crustaceans, amphibians, and reptiles, including the 13-foot-long dimetrodon, an iguana-like creature distinguished by a large sail on its back. Dimetrodon footprints have been found intact, as have whole-body imprints of primitive jumping insects, swimming trails of ancient fish, and corkscrew burrows of wormlike creatures that drilled into the shoreline. Although the monument does not yet have facilities, rangers lead Saturday morning hikes throughout the park. Dominic and I joined a group of about 20 other visitors. We walked to a spot where parts of a tracksite have been extracted, thus exposing red stone that contains a fossilized dimetrodon track and imprints of ancient conifer tree needles. Nearby, limestone held evidence of ancient sea life: brachiopods, sea lilies, and sea fans. Dominic’s first brachiopod discovery had to be left behind, because it was found within the monument boundaries, but he ended our journey with about 30 fossilized brachiopods from the sandstone quarry just outside the monument. He now has them displayed on the dresser and bookshelves in his room, vivid mementos of his adventure. Making our way through time and history, our next stop was the Triassic period—the age of dinosaurs. Traveling U.S. Highway 84 north of Abiquiú, the striking sandstone cliffs and spires jutted out of the basin in bands of rust, white, and gold. Fossil collection has been recorded here since the 1880s, and new discoveries continue to be made, especially at Ghost Ranch, the onetime home of Georgia O’Keeffe that’s now an education and retreat center owned by the Presbyterian Church. “We have arguably some of the best Triassic land vertebrate sites in North America,” said Alex Downs, Ghost Ranch curator of paleontology. The ranch offers weeklong paleontology programs for adults and children during the summer and fall. In 1947, the ranch became world famous when a bed of complete coelophysis skeletons—hundreds of them at all stages of development—was discovered by Edwin H. Colbert, then of the American Museum of Natural History. Pronounced see-low- FY-sis, the dinosaur’s name is Latin for “hollow form,” referring to the predator’s hollow bones, which facilitated its agility and speed. Specimens have since been found only in New Mexico, and in March 1981 the species became the official state fossil. At nearly 10 feet long, coelophysis was considered a small dinosaur. The carnivorous creature ran on two hind legs and hunted insects, small mammals, and reptiles with clawed hands and more than 100 sharp teeth. When Pangaea broke apart, New Mexico’s hot and humid river floodplains filled with dense conifer forests, home to sauropods—long-necked, long-tailed herbivores with voluminous rib cages and pillar-like legs. Evidence of such creatures exists in central New Mexico, at the BLM’s Ojito Wilderness Study Area, near San Ysidro, where primitive trails wander through rough and rugged badlands, bluffs, and hoodoos. Gillette nicknamed the creature “Sam,” but officially called the estimated 110-foot-long beast Seismosaurus hallorum— the earth-shaking dinosaur. Ironically, seismic tomography technology, which creates 3-D images of the internal structures of solid objects, would later be used to look for more of Sam’s bones hidden deep in the ground. By the Cretaceous period, the North American continent as we now know it was almost defined, but high sea levels flooded vast areas in the middle of the continent. Parts of New Mexico were a tropical seacoast, where the final wave of dinosaurs walked the shores. Along the spillway of Clayton Lake, in what’s now northeast New Mexico, approximately 800 tracks record the paths of giant herbivores and their sharp-clawed predators of 100 million years ago. The most common tracks are three-toed impressions of “duck-billed,” plant-eating dinosaurs. The largest track—probably a hind foot—measures nearly 12 inches from the tip of the middle toe to the rear. Clayton Lake also features what are likely theropod (think T. rex) tracks, which are also three-toed but are smaller and more kite-shaped than the other tracks. Clayton Lake contains many parallel trackways that all run north. They are essentially adjacent tracksites made by different dinosaurs. This shows that dinosaurs traveled together in groups, probably along a migration route that stretched hundreds of miles north to south along what was then the Western Interior Seaway. Best viewed with the help of shadows created by the morning and late-afternoon sun, the trackway is flanked by a trail that allows people to reach down and touch the tracks, and read the interpretive markers along the way. These fossils belong to creatures that inhabited the area during the Late Cretaceous period (80 to 65 million years ago). What’s now a desert was then a vegetation-filled coastal swamp. Today the sediment contains remnants of fish, turtles, lizards, mammals, and dinosaurs, such as the 30-foot-long, duck-billed parasaurolophus or the five-horned, plant-eating pentaceratops. Most famous of all is the Bisti Beast, aka Bistahieversor sealeyi, a member of the carnivorous tyrannosaur family. A volunteer researcher discovered part of the skull in 1997, and in 1998 the dinosaur was excavated—its removal was the first paleontological excavation in a federal wilderness area. Today the skull of the Bisti Beast, whose body was probably about 30 feet long and weighed three tons, is part of the Cretaceous seacoast exhibit at the Museum of Natural History and Science, in Albuquerque. But Sherrie Landon, paleontology coordinator at the BLM Farmington Field Office, assures visitors to the badlands that there’s still plenty to discover in the 41,170-acre wilderness area.